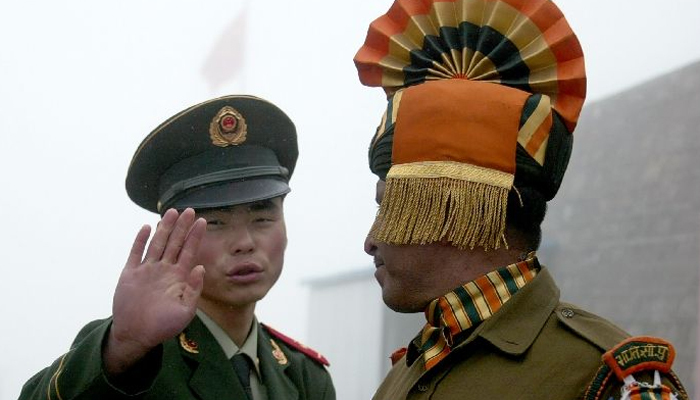 A border standoff between Chinese and Indian troops on a remote Himalayan plateau has heightened long-standing tensions while ensnaring a tiny kingdom, Bhutan, between the two nuclear-armed powers. The row has festered for more than a month as India and China refuse to back down in the distant but strategically key territory, reflecting the historic mistrust between the Asian giants. The area is disputed between China and Bhutan but India’s decision to jump into the fray reflects its concerns about Beijing’s growing military might and ambitions in the region, analysts say. The border trouble began in mid-June when Chinese soldiers started to extend a road through the Doklam territory — known as “Donglang” in Chinese. China, which warned this week that it would step up its deployment, insists that India must withdraw its troops before any proper negotiation takes place. India says said both sides should withdraw their forces. “The solution to this issue is simple, which is that the Indian troops back out honestly,” Chinese Foreign Minister Wang Yi said this week. While the deadlock may be broached during Indian National Security Advisor Ajit Doval’s visit to Beijing on Thursday, there are no signs that either side is ready to back down. “It’s easier to shake a mountain than to shake the People’s Liberation Army (PLA),” Chinese Defence Ministry spokesman Wu Qian boasted at a press conference Monday. Mistrust is hundreds of years old and the pair fought a brief war in 1962 in India’s border state of Arunachal Pradesh. “India views China’s road-building as a threat because (the Chinese) have gone against the status quo of behaviour in a disputed territory,” Shen Dingli, vice dean of Fudan University’s Institute of International Studies, told AFP. The road was being built close to the “Chicken’s Neck,” a narrow, essential strip of land connecting India’s northeastern provinces with the rest of the country. But Beijing maintains that “Doklam has been part of China since ancient times,” countering that Indian troops triggered the standoff by crossing a boundary established in an 1890 agreement with Britain. Zhao Xiaozhuo, a senior Chinese colonel and an analyst at a PLA think tank, said it was “ridiculous” for India to view the road construction as a threat. “India views infrastructure in the border areas as only for military use with little consideration for their valuable role in economic development,” Zhao wrote in the state-run China Daily. Bhutan has taken a backseat as India and China scuffle. Jayadeva Ranade, head of the Delhi-based Centre for China Analysis and Strategy, said China is trying to establish a “pro-Beijing lobby” inside Bhutan. Chinese President Xi Jinping nor Indian Prime Minister Narendra Modi can back down without facing a “nationalist backlash” back home, said Huang Jing, a Sino-Indian relations expert at the National University of Singapore. Xi in particular must exude strength as he consolidates power before a crucial Communist Party congress later this year. “This situation is very dangerous. I don’t think China has much choice if the Indian troops stay where they are — Xi will have to demonstrate to Chinese people whether he means what he says,” Huang told AFP. India fears that China’s “String of Pearls” military and commercial network in the Indian Ocean increasingly undermines its own geopolitical status. And it has voiced concern about another Chinese project: The China-Pakistan Economic Corridor, which will give Beijing access to the Arabian Sea but passes through the hotly disputed Kashmir region. The project is part of a massive Chinese global trade infrastructure programme dubbed One Belt, One Road, which India has snubbed. The standoff is a very public sign of India’s willingness to push back. “As this face-off continues, the one who’s actually losing ground are the Chinese because they have styled themselves so far as a major power whom no one can challenge,” Ranade said. “So the fact that India has stood up to them is a message to all other countries in the region. Edit"A border standoff between Chinese and Indian troops"
Sub : Welcoming “Your Goodself” to grace the occasion as a “Special Media Invitee” at “INDO-RUSSIA Friendship Day” being Organized by “Falcon Media”, Publishers of “MARKENOMY & ENERTIA” Supported by the “Defence & Marine Biz” & “PSE Journal” &in Association with Non-Profit Mother Organizations “MARKENOMY Foundation & ENERTIA Foundation”. Theme: Defence, Infrastructure, Logistics, Renewable Energy & Power, Mining & Natural Resources etc. It is our pleasure to communicate here that “Falcon Media” (Publishers of “MARKENOMY & ENERTIA” journals) and “ENERTIA ENFRAMedia Pvt. Ltd. (EEPL)”, the Publishers of “DEFENCE & MARINE Biz (D&M)” in Association with MARS Media Resources (Publishers of “PSE Journal”) are organizing “INDO-RUSSIA Friendship Day” with an aim to promote greater Economic and Technological Co-operation between INDIA & RUSSIA in the Strategic Sectors led by Defence, Infrastructure, Logistics, Renewable Energy & Power, Mining & Natural Resources etc. SCOPE (Standing Conference of Public Enterprises) is the “Supporting Theme Partner” for the “INDO-RUSSIA Friendship Day”confirmed via the Office of Director General, Dr. U. D. Choubey, being organized on Friday, 28th July, 2017 in New Delhi. Please find attached the “Flyer / Brochure” for the “INDO-RUSSIA Friendship Day”. The “President/Chairman of Organizing Committee & Eminent Organizing Council Members”, derive great joy and pleasure in having your ‘Consent for Graceful Presence’ as a “Special Media Invitee” at the “INDO-RUSSIA Friendship Day”. This “INDO-RUSSIA Friendship Day” is an ‘Evening Program’ and will have RUSSIA represented by Mr. Oleg Pagiev, CEO,Territory of Logistics LLC. & Mr Alexey Komissarov, CEO, TrackAll RUS. The program will have select presentation and proceed with a‘Dinner & Networking’ for the Russian representation along with Indian Dignitaries including PSE Head Honchos, Private Sector Entities etc. organized by the Hosts (India side – Falcon Media – EEPL & SCOPE combine). Dr. V. K. Garg, Former Chairman, PFC & Ex. Chairman, JERC; Dr. Hirdesh Khanna, CMD, IKRATOS Solargie; S. K Chaturvedi, Former CMD, Power Grid Corporation of India Limited; Ex. Chairman JERC; A. B. Agrawal, Former Chairman, BBMB; Ex ED, NHPC Ltd; Rajinder Kaura, CMD, BERGEN Solar Power & Energy; P. K.Sinha, Head – HR & CC, SCOPE etc. We now look forward to your “Valued & Gracious Presence” at the “INDO-RUSSIA Friendship Day” on Friday, 28th July, 2017 in New Delhi, SCOPE Convention Centre – AUDITORIUM, 6-00pm onwards. Edit" “INDO-RUSSIA Friendship Day” being Organized by “Falcon Media”"
The Sony Pictures Sports Networks (SPSN) will broadcast India’s tour of Sri Lanka, which kicks off on 26th July 2017. The series promises to be a treat for cricket enthusiasts, with a line up of three tests, five ODIs and a standalone T20, to be played across four scenic venues in Sri Lanka. For the first time in three years, India will be playing a series that has matches in all three formats, overseas. India’s tour of Sri Lanka will also see the network’s celebrated live wrap-around analysis show ‘Extraaa Innings’ hosted by Harsha Bhogle. Showcasing, pre, mid and post-match analyses of the series, the wrap-around show will feature expert insights from an impressive line-up of panelists like Sunil Gavaskar, Ajay Jadeja, Murali Kartik and Russel Arnold. Moreover, Simon Doull will provide pitch analysis. Edit"Sony Pictures Sports Network to broadcast India’s tour of Sri Lanka "
GPU-Gandhar organized a Swachhata Activity in active association with Bharuch Nagarpalika in the Slum area of Bharuch City. The activities mainly included (i) Handing over of 100 Nos. Roto Moulded Dustbins & 2500 pairs of Small dustbins (Blue & Green) and on-the-spot distribution of 220 Nos. small dustbins to slum dwellers (ii) Distribution of Sanitary Napkins to adolescents residing in the slum area by Medical Officer & GAIL Ladies & (iii) Cleaning activity. On this occasion, Shri R.V.Patel, President, Nagarpalika, Smt. Nina Yadav, Chairman, PWD-Nagarpalika, Smt. Parvatiben Parmar, Member-Nagarpalika and Shri Sanjay Soni, District Municipal Officer (DMO) & Chief Officer, Nagarpalika and their team members were present. From GAIL-Gandhar, Shri U.P.Bhagat, General Manager (GPU-O&M)/OIC, Shri Sharad Chaturvedi, DGM (O&M) were present along with HoDs/employees & their spouses and GAIL Medical Officer, Dr.Garima Soni. Speaking on this occasion, Shri U.P.Bhagat, GM (O&M) expressed the need of Health & Hygiene in day-to-day life and conveyed sincere thanks to the Bharuch Nagarpalika for their active and overwhelming support to take forward the Swachh Bharat Abhiyan. Shri Bhagat also administered ‘Swachhata Pledge’ to all the dignitaries and gathering. Shri R.V.Patel, President, Bharuch Nagarpalika expressed his satisfaction for the contribution of GAIL and assured all kind of active support from Nagarpalika to make the Bharuch City-a Clean City. In addition to the above activity undertaken in the forenoon, Shri U.P.Bhagat, GM (O&M)/OIC also had a Meeting with the Safai Sathis and support staff in the afternoon and appreciated their contribution. Dengue deaths increased by almost seven times from 2014 (74) to 2015 (486). From 2014 to 2016, Delhi saw an average of 5,89,683 cases of diarrhoea annually. As many as 41% of deaths due to diarrhoea were of children 4 years of age or younger. 22% of the total diarrhoea cases were in Rural Narela Zone alone. There were 7,985 institutional deaths due to tuberculosis in 2014 and 2015. In 2016-17, the average Delhi household spent an estimated Rs. 1,07,793 as annual expenses on health. Only 15% of citizens are estimated to have health insurance. 26th July, Delhi: Cases of diarrhoea and hypertension spiked in Delhi from 2015 to 2016, a white paper on the state of health of Delhi published by NGO Praja Foundation revealed. Diarrhoea cases increased from 5,64,416 in 2015 to 6,22,480 in 2016, and the city registered an average of 5,89,683 cases from 2014 to 2016. Hypertension cases increased from 3,22,510 in 2015 to 3,61,443 in 2016. Even as the capital has seen an extremely high number of diarrhoea cases in the past three years, citizens lodged a large number of complaints about polluted water in 2016, indicating that people had raised concerns about the issue to the authorities. Among various civic issues, the maximum number (2,27,444) of civic complaints in 2016 by far were on water supply. These constituted 50% of the total complaints in that year. This data was procured by Praja Foundation under the Right to Information (RTI) Act, 2005. Zone-wise data collected by the organisation revealed that Rohini Zone of North Delhi Municipal Corporation had the highest number of (8,599) cases for Dengue in the last three years (26% of the total). With respect to tuberculosis also, Rohini Zone saw the highest number (74,477) of cases for Tuberculosis in the last three years. The cases in Rohini Zone alone constituted 33% of the total cases of tuberculosis in that year. Rural Narela zone had the highest number of (3,84,401) cases for Diarrhoea in the last three years. The cases in Rural Narela constituted 22 % of the total diarrhoea cases in Delhi. The white paper also included estimated data on the household expenditure incurred on health by Delhi citizens. This data was collected through a survey commissioned by Praja to research organisation Hansa Research. Shockingly, the average Delhi household spent an estimated amount of Rs. 1,07,793 on healthcare in 2016-17. Further, only 15% of citizens were estimated to have health insurance. “This means that while on one hand, authorities are not taking enough preventable measures to check the spread of diseases, citizens are spending humungous amounts of money on their healthcare needs. Further, as highlighted by the data, health risks disproportionately affect poorer households,” Anjali Srivastava, Assistant Manager at Praja Foundation, said. Even as the city continues to see very high cases of major diseases, the responses of elected representatives to several of these diseases appears to be inadequate. For instance, medical relief and public health committee councillors did not raise even a single issue on tuberculosis from April 2015 to December 2016. Similarly, MLAs also did not raise even a single issue on tuberculosis from the time of their election on 24th February, 2015 to 15th November, 2016. “In order for concrete steps to be taken to improve the state of public health, it is absolutely essential that there should be a proper data management system on various diseases. There is no way that the authorities in charge of running Delhi can confront the various health challenges confronting the city unless they have a clear idea about their magnitude,” Milind Mhaske said. PRAJA was founded in 1997 with a vision to re-establish accountability and transparency in governance. Fuelled by a concern about a general lack of interest among the Citizens’ in the local Government; Praja aims to create awareness among the citizens, and therefore empower them though the knowledge. PRAJA believes that the availability of information can go a long way towards simplifying people’s lives and evoking participation. This aims to ensure a holistic approach for ushering good governance must have buy in of our ideas from the elected representatives. At the same time, there should be tools and mechanisms which enable citizens to keep a close watch on the work done by their elected representatives. PRAJA’s goals are simplifying people’s lives, empowering the citizens and Government with facts and creating instruments of change to improve the quality of life of citizens in India. PRAJA is committed to creating an accountable and efficient society through people’s participation.